Discussion in '9/11' started by Contrairement, Sep 10, 2018. I'm french, so I apologize in advance for abusing the English language. Seconds after the WTC2's collapse, there was a plume of smoke rising from a far building. This strange plume of smoke raises questions among some ''truthers''. Is it related to the collapse ? How ? A - The Goldman Sachs' black smoke come from WTC2's dust that has spread over Manhattan ? OR The Goldman Sachs' black smoke come from an internal building incident that was caused by WTC2's dust. C - In its destruction, the WTC2 may have damaged important electrical installations. Some of the Goldman Sachs' electrical equipment could have been impacted to the damage and produced black smoke (which was then expelled onto the roof, through the ventilation systems). D - This is just a coincidence : an incident occurs in the Goldman Sachs Building at the same time as the WTC2's destruction, without the two events being linked. I do not believe at all in A and B.
F. the smoke is coming from behind and to the right (due to camera angle) of the old Goldman Sac's building. Can you find any post 9/11 photos of 85 Broad street with a damaged roof? Don't think you can. Why do you think that ? I used 8 points of view, 8 different shots. You don't trust my location method ? I don't have any photo of the roof at all, except on satellite images. But I don't think that the roof was damaged. We just see black smoke coming out of the ventilation systems. I think the incident is inside the building. well I do have problems positioning my camera in Google maps. But a photo from the same location was taken on the roof of 475 kent street Brooklyn, and when I looked from there and both photos side by side the plume doesn't look like it is coming from the roof. You don't trust my location method ? long distance lenses can make things look like they are in a position they are not. Say, for example, the plume was coming from the Battery-tunnel Ventilation Building (no damage reported there as far as I could find)... it would still look like it was coming up over the old Goldman Sachs building. A subway tunnel I guess is always an option.. but basically wouldn't those little roads in lower Manhattan, act like major wind tunnels for smoke? To me the timing is too coincidental to not be from the collapse in some way. Plus if something blew up in Goldman Sachs there would be reported damage. If there was a fire then why not more smoke? and why would they hide it? (I don't buy the 'to destroy documents' theories because there are easier ways to destroy documents.. fire and/or explosions is not a sure fire way to destroy documents. and not that verifying your location views is going to change my mind that the plume is behind Goldman Sachs.. but you really should give people coordinates in case they want to verify your positions. Are you referring to this picture ? I think the plume comes from the roof. At the moment of expulsion, you can see a ball of smoke forming to the left of the main plume. It's impossible for this plume to come from the ground, no way. We agree that you saw the video ["Goldman Sachs' plume of smoke..."] where I locate the plume ? (I ask because you answered very quickly to my first message). If we agree that Hopewell's footage shows the beginning of the expulsion, I can prove that no other building match with the videos. I still don't understand why you desagree with me. Give me a building or a place that you think is best suited. A subway tunnel I guess is always an option.. but basically wouldn't those little roads in lower Manhattan, act like major wind tunnels for smoke? I've already proved that the smoke of the collapse couldn't reach 85 Broad Street Building (or even any place behind it) at the time of the expulsion. If there was a fire then why not more smoke? and why would they hide it? (I don't buy the 'to destroy documents' theories because there are easier ways to destroy documents.. fire and/or explosions is not a sure fire way to destroy documents. Yes, it's probably not a fire, there is not enough smoke. I was thinking less about documents than computer servers. But it's highly unlikely. I prefer the electric hypothesis, or even the coincidence hypothesis. Are you telling me that your opinion on the matter is definitely sealed ? but you really should give people coordinates in case they want to verify your positions. Here you can find a file that works with google earth. All camera locations are shown, these are the coordinates I used. well no I was referring to photos by Robert Clark (yours is from a guy named staehl?) but they were on the same roof. I believe your "femr" video that you are calling Hopewell came from the same roof. Apparently it was/is an 'artist' commune, so lots of artists/photographers living there. Hopewell was filming his television set. But I digress..
Perhaps, but your gif to me seems to confirm to me anyway it is coming its coming up from behind the building. yea I don't know that much about the physics of smoke. there are other buildings behind Goldman Sachs though is mostly what I'm saying. Obviously I'm not agreeing with that. I do not think it is definitive. I can prove that no other building match with the videos. I still don't understand why you desagree with me. Give me a building or a place that you think is best suited. one thing you seem to be missing in your graphics is movement/wind. you can tell from the height and shape of the plume (as well as the Tower ash plume) that the time of each 'plume photo' is different. that is a VERY rough example.. (femr is what you are calling Hopewell) and my red arrow is going too east but the smoke plume probably was moving. "NBC" looks more east then I meant but I don't know how to make it look more south on a 2d drawing. Did you? here? I don't see it. I saw your 2015 thread at Reopen911 (where your lines were in different places) where you discuss speed of debris etc. But I don't see that here on Metabunk. and that is a topic the math nerds here will have to ponder. My current premise is that it is not definitive the plume originated over Goldman Sachs building. Either way that would be a pretty big fire burst inside the building and no one mentions such a thing in the news that I could find. "Any space, however primitive, where they can call on their clients and also interact with each other, is key at this point," said Richard Strauss, a Goldman Sachs Group Inc. analyst who covers brokerage stocks. His office at 85 Broad St. was unscathed. Obviously this is speaking of a specific office, not necessarily the whole building. my opinion that it is not definitive the plume originated atop 85 Broad street is pretty sealed yea, unless text evidence comes to light describing an explosion of a server or something inside the building. where? I don't see it on that link. why can't you post the coordinates here on MB? ps sometimes when I say "behind Goldman Sachs" I mean to the east WEST of GS. depends on which video footage we are discussing. sorry for any confusion on that issue. edit *changed to "west" .. the west side highway side of Goldman Sachs. oh and just because you are interested in this subject, i'll throw out an observation. Robert Clark's photos (and possible video footage ie femr video) the smoke is much blacker than in other photos of the towers on fire. (I'm breaking the Link policy here because I think he might be a stickler for copyright infringement)..
Not sure if that means anything as far as the 'smoke' plume being discussed. add: here is the same smoke from the Jersey shore. Do you think that it is possible that with all of the overloading of electric and communication n lines that it could have been something that burned up on the roof? Something like a transformer blowing? In your original video that you posted in the OP, Contrainment, the plume that you highlighted seemed like more of a "rising smoke" situation, not a pressure ejection through subway tunnels or anything like that. Although, if it did come from a lower elevation, as Diedre is theorizing, it could have been an ejection that has slowed as it rises into the air. @Contrairement you are right about the videographer being Hopewell, I found the NIST footage naming him. Guess I got confused with a youtube channelers name. and he did sell the footage to CBS (Dan Rather is CBS) which also explains why NIST couldn't release Part 1 of the footage. Intellectual property. He sold the video to CBS for a five-figure sum and was handsomely rewarded for stills which appeared on the front of Newsweek magazine. what about a steam pipe burst? I'm not finding any articles about that, but if the plume is white, that might work. My first thought is that it is either the OP's hypothesis A.1, (smoke from the collapse), or hypothesis C, transformer explosion (my interpretation) from infrastructure damage in the collapse. I did some quick math on the OP's A.1 theory and came up with various rough numbers for how fast the smoke from the collapse would need to travel to reach the building in question, Goldman Sachs. I was thinking that this would be a quick test of whether A.1 is possible or not. I don't have video editing software so the timings below come from starting and stopping the videos at certain points. 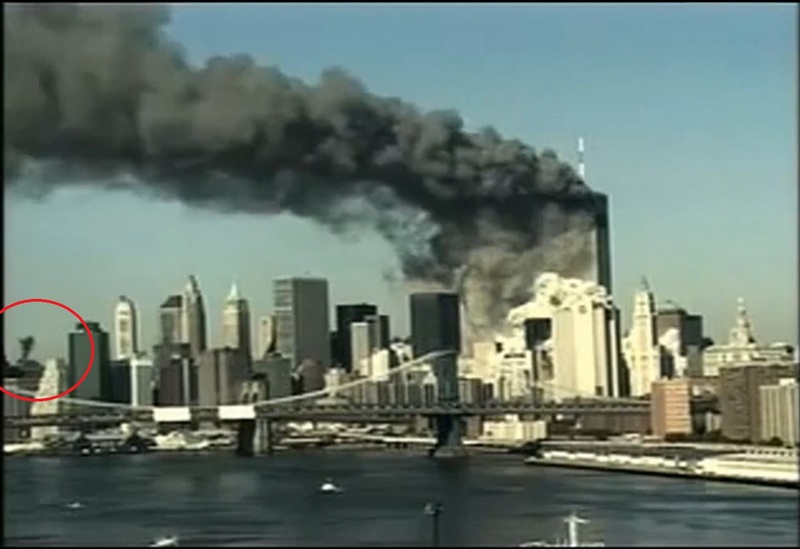 The start is roughly when the collapse front/wave becomes obscured by the buildings in front of WTC1, and then stopping again when the smoke is visible over Goldman or other obscuring building, noting the elapsed seconds. Using Google maps, my best guess of the distance from WTC1 to Goldman is about 2000 feet, allowing a calculation for feet per second, followed by a conversion to miles per hour. Numbers are rounded as the methodology is not very accurate in the first place. B - :25 - 1:57 - 22 - 15 - I don't see the GS smoke on this one until it rises over the bridge. G - 4:49 - 5:15 - 80 - 54 assuming it's the building mostly obscured by the greenery, but that's a stretch. Conclusions: I almost deleted this post when I looked at the results, then realized a couple of things. My methodology is crude and probably contributes to the wide differences in speed. Maybe someone can use my start/stop times to come up with a better analysis. However, a couple of seconds either way doens't make much difference in the speeds. Video A looks like an outlier, but it's the only video that shows a clear, dense, start to the GS plume. This could be the only video that shows the source (or near the source). The other videos have other buildings in the way so we're seeing a rising cloud of smoke instead of the origin of the plume. Most of the videos show the plume rising behind that white building. I don't have the tools to validate the angles to my satisfaction, so I can't offer an alternative. 104 MPH seems excessive. I assume it's possible for the smoke and dust to reach 100 MPH, but I haven't seen anything that suggests anything like this actually happened. So, assuming A is not edited somehow, I have to vote for a transformer explosion on top of one of the buildings near Goldman Sachs, or GS itself. A Google image search for "transformer explosion" shows characteristic dense black smoke that persists for a surprising length of time. Running out of time tonight so will have to post a better rooftop photos with a view of the transformers. Edit: Will add more tomorrow, but ran out of edit time and had to leave. I was editing directly onsite and had no backup plan. My bad. Numerous grammar, spelling, and content edits. I believe what you are seeing is black smoke from backup deisel generators starting up. The collapse likely cut power to many blocks around. when the mains power goes out. However, based on this idea, I am surprised we are not seeing more plumes. I think this is right. As to why you don't see more plumes from other generators spinning up, I would guess that's because the back-up generators in NYC buildings are not always (or even often) located on the topmost mechanical floor. I couldn't find solid statistics on this point via some quick google searches but my understanding from a historical tour I took years ago is that, owing to regulations first adopted after the great fire of 1835, buildings over a certain height are required to have water tanks above their topmost occupied floor (which is why all major skyscrapers in NYC have large, "fake" tops that hide substantial mechanical floors). As a result, I would expect that many buildings, like the old WTC7, for example, would use lower mechanical floors to house back-up generators as a matter of economy of space. I can't find one exactly the same, but it's consistent with an array of eight diesel generators, with fuel tanks on top. All eights starting at once could easily be responsible for this cloud. State-of-the-art infrastructure including above standard electrical capacity, supplemental cooling and back-up generator capacity. 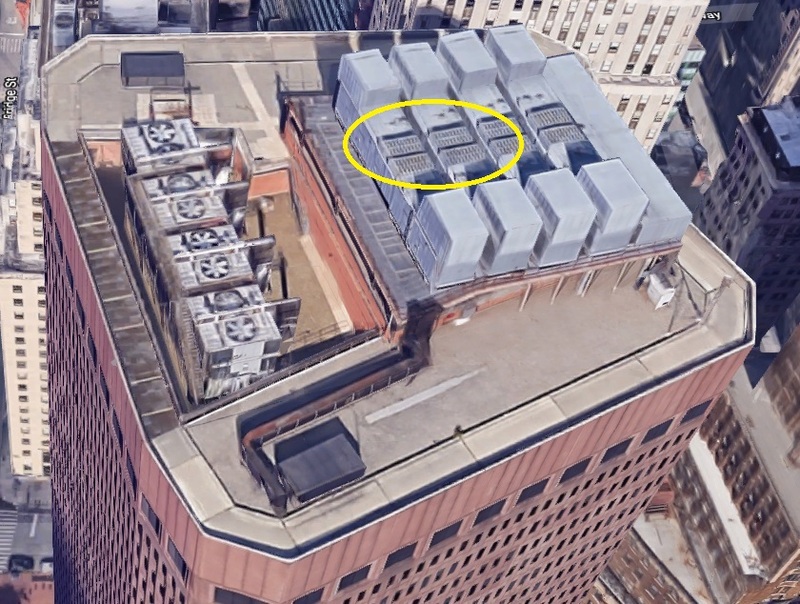 As to why you don't see more plumes from other generators spinning up, I would guess that's because the back-up generators in NYC buildings are not always (or even often) located on the topmost mechanical floor. 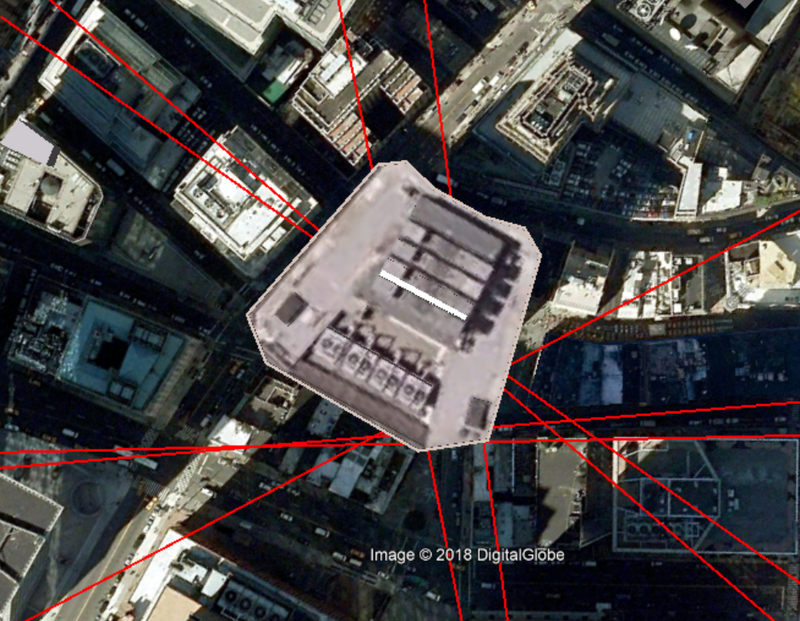 Been browsing google maps sattelite view around Manhattan, and I would agree that there are not that many rooftop generators. 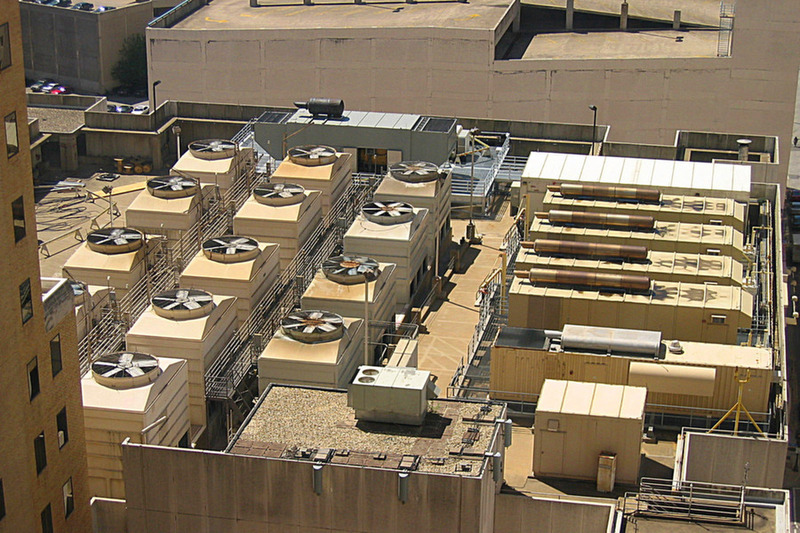 Most buildings seem to have A/C units up there, but not as many as I imagined with generators. But 85 Broad St (the second image in the OP under Localization) does have at least 8 large ones. That explains the lack of many similar plumes. I am 95% convinced that the answer to this thread is a generator (one or a few) starting up. well the first 3 minutes, your music was too annoying to watch the rest. I'm really sorry for that, but you could have turned off the sound for the sake of the discussion. oh and just because you are interested in this subject, i'll throw out an observation. Robert Clark's photos (and possible video footage ie femr video) the smoke is much blacker than in other photos of the towers on fire. Getty's video is probably the best one to determinate the color of the plume. It appears exactly the same color as the smoke from the fires in the WTC1 - black -, unlike the dust that appears white. Do you think that it is possible that with all of the overloading of electric and communication n lines that it could have been something that burned up on the roof? Something like a transformer blowing? In your original video that you posted in the OP, Contrainment, the plume that you highlighted seemed like more of a "rising smoke" situation, not a pressure ejection through subway tunnels or anything like that. Yes, I think transformer hypothesis is the best one. However, the slow rise of the smoke is also consistent with an internal incident (transformer explosion or else) that spit out its smoke through the ventilation. Thank you very much for your work, Mechanik. I guess it's extremely difficult to estimate the speed of dust from these videos. To work around the problem, I just synchronized video A with videos of people near WTC2 (7m15s in my video "Goldman Sachs' plume of smoke..."). I could see that the cloud of dust, at the time of the plume expulsion, is really far from the Goldman Sachs. Yes, it's a good clue. I agree. And I want to thank you all for your precious help. Agreed. it seems pretty "one and done" in the video, meaning that it isn't much of a sustained burn. Is there anyone who has seen this before? I would have to believe that some New Yorkers have seen this during power failures before and wondered "what is that black smoke?". It seems to take a bout 7 seconds from the moment that the towers hit street level to when we see the initial smoke. If the towers collapsing into the basement caused the electrical grid to fail, then I would think that would be reasonable timeline to fire up the generators. I was looking up how fast they would kick on after a power failure, but was coming up empty, due to time shortness. I will see if I can fond anything. I have seen it first hand at my office building in New England. My window overlooks the neigboring buildings flat roof. Roughly 10 seconds from my recollection from outage to Generator running. whereby, a bttery bank provides power for a short time while the Gen comes online. Our computer systems are thereby unaffected by power outages. I was looking up how fast they would kick on after a power failure, but was coming up empty, due to time shortness. I will see if I can fond anything. I am looking around, but can't seem to find any specs on how fast you would expect the generator to kick on. In the situation at hand; if it is the generator, you would need to know when it lost power anyway, so it might be a moot point. Sounds like we have at least one eye witness to this Phenomenon. Did it kick off a similar plume of exhaust smoke, @PIH123? Also, it looks like GS has about 8 of them (Unless it is 4 big ones). Did your building have this big of an array? They are probably not going to start immediately. In the Backup Generator Test video above, there ten seconds of silence, then ten seconds of starter motor, and then five seconds of smoke. I'd suspect that they are set to wait a while before starting, as there's no point switching them on for a 2 second outage. And many buildings cover a few seconds to a minute or so with battery backup. So a delay certainly fits. Even if it's just the 10 second starter motor before smoke, that's about the time between the debris hitting the ground and the smoke appearing. that's not why. I saw the 'submerged' vents in your Opening Post. it's because of the angle of view and a little bit of black smoke in the beginning that seems to be a tad too low, of course if the wind is blowing toward the viewer and to the our left (Getty image) then it would eventually obscure that lower bit anyway due to perspective. that, and it is possible for smoke from say the Hilton (for ex) to just happen to rise up at that spot. stranger things have happened. In Los Angeles, Silicon Valley, and Seattle, big backup generators, like for data centers, are beside the building, or underground (under the parking garage), or on one of the lower floors of the building. I had never heard of putting thousands of gallons of diesel fuel on the roof of a building. However, in searching for NYC building codes I found that cities on the east coast prefer rooftop generators to avoid subterranean flooding issues. In NYC, generators are required for buildings over a certain height (60' although I couldn't find a Code source for that ). I did find the building code for generators and it even had specs for the fuel tanks on the roof. This URL points directly to the NYC building code PDF for emergency generators. The code also specifies that the generators have to withstand fire for 2 hours, so I'm going to guess that these units have been sprayed with some type fire resistant and/or sound-deadening (required by code) foam which obscures the shape and makes the units hard to identify. I'd also speculate that the units are modified from their typical configuration to put the cooling system intake and radiator in the block on top of the unit. That would mean the air exit vent is the rectangle on the top at the center of the roof, on each unit. Not sure what the other small protrusions are on the units. It would seem that there would be blackening on the roof of each unit if these were exhaust pipes. In our data centers, we tested each unit for an hour every week and the exhaust pipes were very dirty. These GS units might share a common exhaust pipe or we just can't see the soot in the photos available. That could actually explain the large amount of smoke, though, if all of them fired up at once. I'm just surprised we didn't see more of them firing up on 9/11. On the other hand, the apparent shortage of rooftop generators in the photos might just mean that most buildings still have them in the basement and the startup clouds never made it high enough to be visible. It still seems like a lot of generators, but if you read the Code, they have to power a lot of things, including 3 elevators. If the GS building has a data center on site, that would probably require 2 or 3 generators all by itself. Ours was a test outage so we were expecting it. It was part of our "bi-annual" DR tests. At around noon that day, the mains panel for the building was "turned off" by someone in maintenance. The lights dimmed briefly, but never went off. I wasn't sitting at my desk, because I assumed there would be a brief computer outage. And that the entire company would need to start powering up and logging on again after that. This usually takes a while, so I took a break until the "fun" was over. single large generator. We joked about it looking like a youtube "rolling coal" video. It lookes just like Micks example video above. This was (from memory) about 15 seconds after the light flicker. It could have been anywhere from 10 to 30 seconds. But there was no "fun". Nothing went off, the network stayed online the entire time. That is an unusually intelligent response. You can take pride from it. I've debunked my theory that the plume could possibly be from a building further back. This photo is pretty much the exact same time that plume was already "lifting" and it is not behind (to the west) the Goldman Sachs building. the building is at a bit of an angle, so the vents are just behind the tall tan building (and since 'stranger things do happen', in the two photos I found from this general angle at different altitudes both have the plume behind the tall tan building). 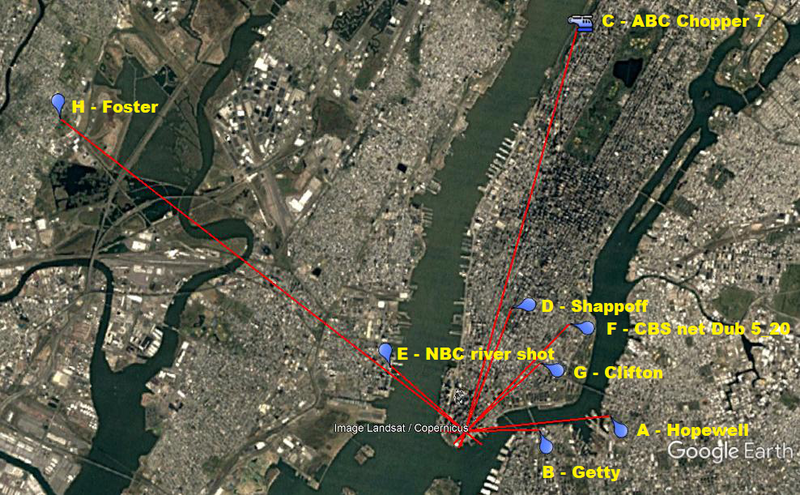 the blue area in middle I had already determined to be around the NYStock Exchange, which is quite far from GS. Also (not that it matters) but the helicopter altitude needed to get the buildings to look like that is pretty high, so there isn't much hidden behind the tall tan building as far as other options for plume origination.